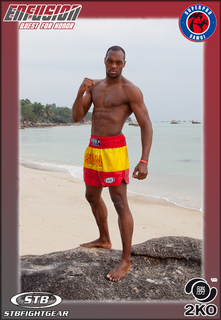 Enfusion 3 the kickboxing reality TV show should be wrapped up or close to wrapped up at the time of this writing. As is typical of the It’s Showtime reality television program the tournament fights have occurred along the way. If you want to avoid spoilers of the outcomes be warned this will let you know how much of the events went. It’s now down to the last 4 representing the 95 kg class for the show. First among these matches is to be Spain’s Frank Munoz who recently fought Australia’s Nathan “Carnage” Corbett in Australia. Frank Muñoz is matched against his next opponent is Wendell Roche, the Holland representative who has also survived fight eliminations this long to face Munoz. ~ by fatsoking on February 22, 2011. This is the Finale of Enfusion 2 ‘Quest of Honor’ 95kg MAX that took place in Prague -Czech Republic. The Finale of Enfusion 3 ‘Trial of the Gladiators’ 85kg MAX will take place in Slovenia on november 25th, 2012.